Iowa ODP offers two different team formation structures based on player age; 1. Iowa ODP District Teams and 2. Iowa ODP Age Group Teams. This refers to the youngest three age groups within our ODP program (2005s, 2006s, and 2007s) and is designed as an introduction to the programs Elite Youth Performance Pathway. The district teams are organized regionally within the state (i.e., east, west, and central) to minimize travel and maximize player development. 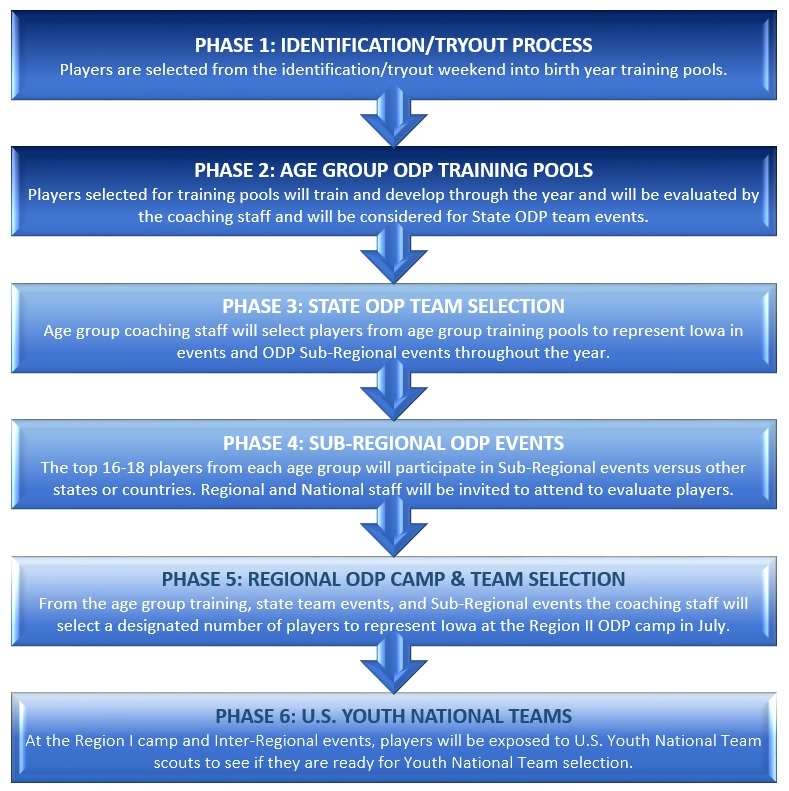 The 2005, 2006, and 2007 age groups are part of the early identification and development process for Iowa ODP Program. Any player within these birth years is eligible to attend tryouts on August 11-12, 2018. From the tryouts, a pool of players for each age group and gender will be identified for further training and potential selection to event rosters and/or regional camp in July. The District Program offers an ideal opportunity for players to sample the program through District training centers. Players of all competitive levels are encouraged to attend district tryouts. Participation in the District Select Program is not an essential prerequisite to future participation in the US Youth Soccer ODP, however, the earlier a player's skills and potential are identified, the more help it can be to the evaluations of district, state, regional, and national coaches. This refers to the age groups within our ODP program that form State teams and is designed as a means to train and develop the elite players throughout our state. This program is open to all players born in the eligible birth years and begins with the tryout/identification session on August 11-12, 2018. At the conclusion of the identification process, a pool of approximately 24-32 advanced players per age group (boys and girls) will be selected for further training, development and potential selection to tournament/event rosters, as well as regional camp in July. Players of all competitive levels are encouraged to take part in the tryout/identification session. In late August/early September, age group training pools (approx. 30 players) are identified from the open tryouts. A player may also be identified/recommended and asked to join at any time during the season. It is the ISA State Coaches' responsibility to select 18 players in their respective age groups for specific events and tournaments. Technical Leaders will scout games throughout the year looking for talented players. Selection is not an easy task for age group coaches. The head coach uses input from other qualified coaches and club directors in order to make sure all players are accurately assessed. Players are evaluated on the following components of player development. Of those listed, emphasis is often placed on the players technical, tactical and skill development. Evaluations: Because of the volume of players attending selection we are unable to provide written individual evaluations on all players. We remain available to discuss selections with players and their coaches once the tryout and selection process is complete. Attendance: attendance at the tryouts are essential and therefore it is critical that interested players attend. If you cannot attend the tryouts listed, please contact the ISA Director of Coaching (in writing and in advance of tryouts), identifying the conflict and rationale for not attending. In certain circumstances players can be considered through scouting program.